The recent warm temps have tricked me into believing that spring really is right around the corner. Deep down, I know that this is just a tease and we will again be wearing winter clothes at least for a few weeks. 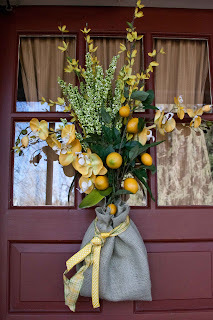 So while I am in a spring mood, I decided to dress up my front door to match. I made a trip to my local crafty store to see what they had that I could hang up, straight off the shelf. I was not impressed with the offerings. Everything looked too fake, too kitschy, too pastel, too much like a dusty old wreath that you might find on Crazy Aunt Lou's front door. I'm a creative girl with a mind of my own, so I figured I could make something myself that would be oh so much better than anything I could buy pre-made. So I did. 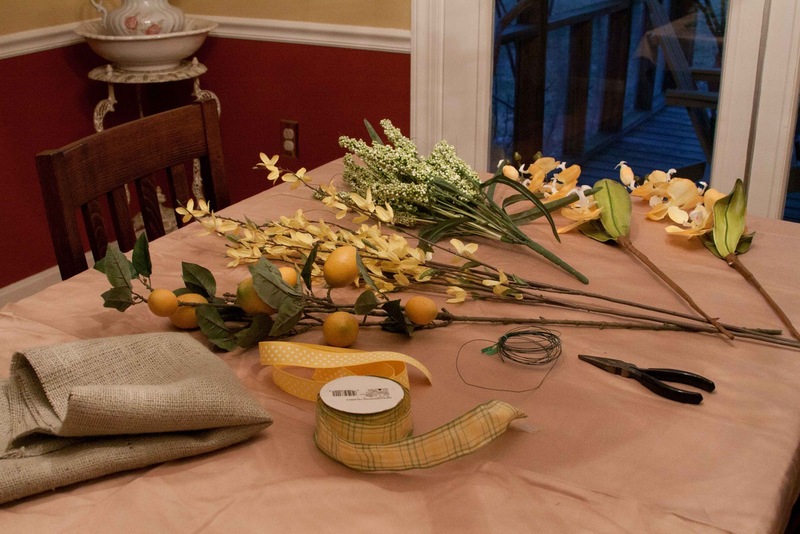 Here's what I purchased for my project: a selection of yellow forsythia and orchids, pale green and beige berries, a lemon tree branch, a half yard of burlap and two types of yellow ribbon. I already had the floral wire. 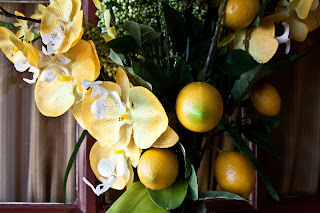 I arranged the flowers and foliage to please my eye. I have no training in flower arrangement; I just know what looks good to me. I tightly secured the stems together with the floral wire and evened the stem lengths with wire cutters. 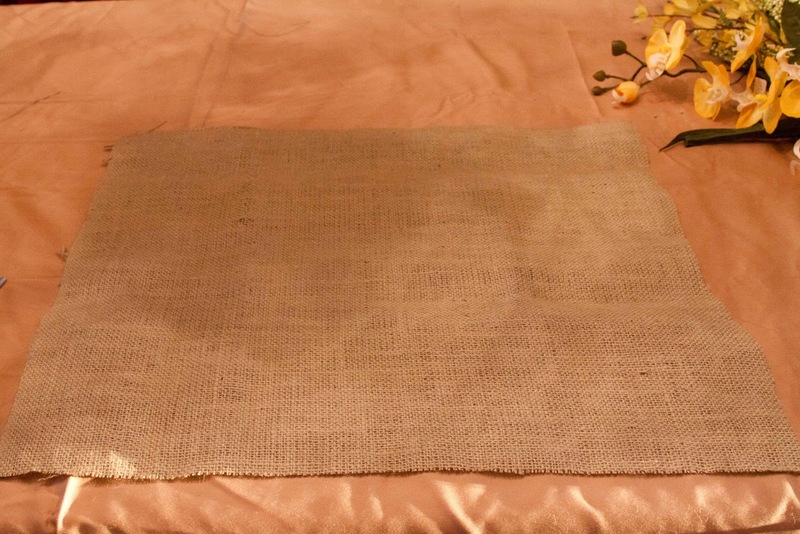 I cut my half yard of burlap in half again to make it almost square. (I purchased more than I needed just in case I made a mistake). The fabric lady at the crafty store showed me a cool trick. 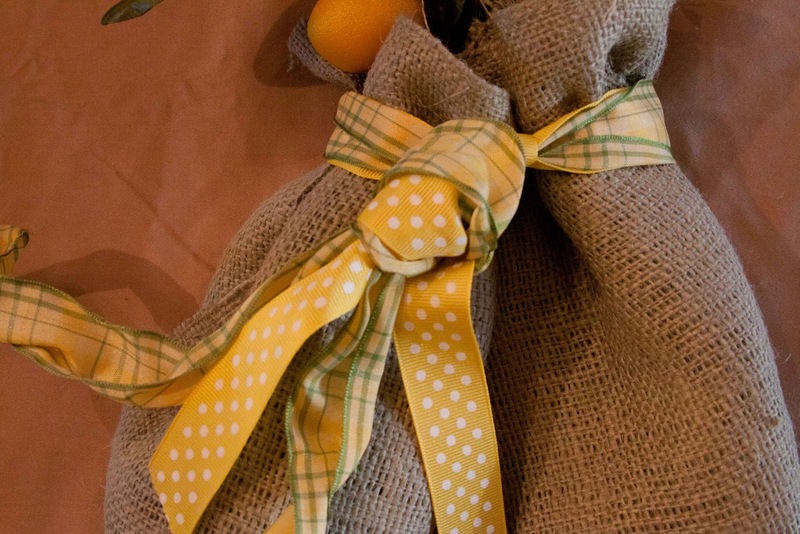 Burlap is hard to handle and difficult to cut a straight edge on. 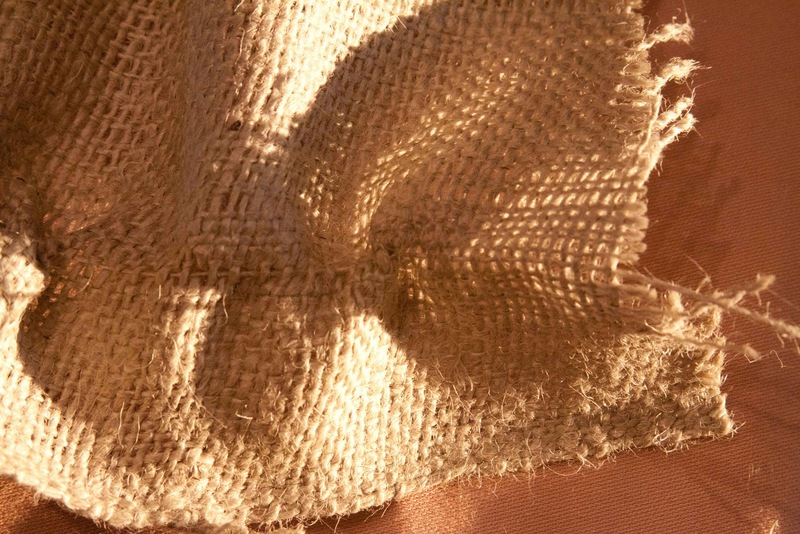 To remedy that, pull a loose thread in line where you plan to make your cut. The fabric will start to gather and bunch. Slide the gathers toward the opposite end and continue to pull the thread completely through. 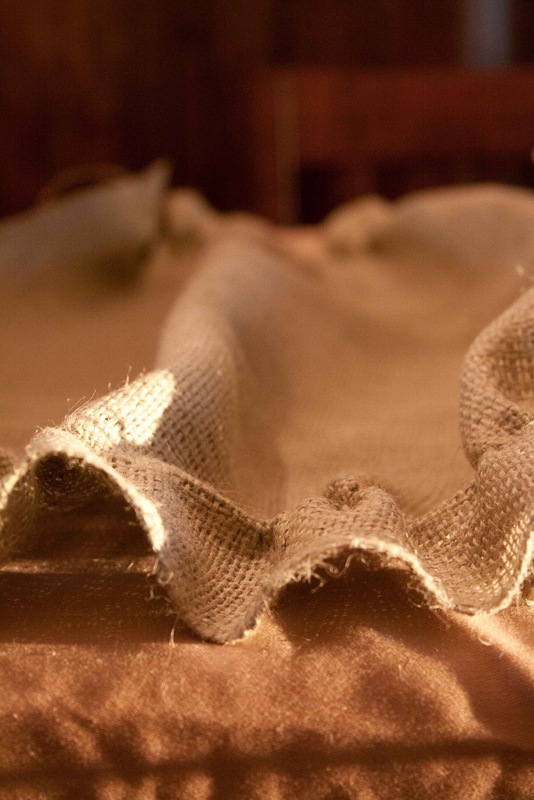 Once the thread is completely pulled out, the gathers disappear and you are left with an open row in the burlap where you can make a straight cut. 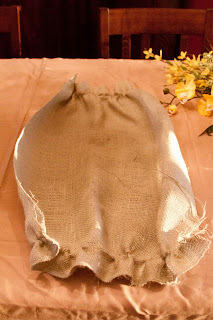 I used this trick to make a faux gathered-top bag out of my burlap. I did so by not pulling the thread completely through. 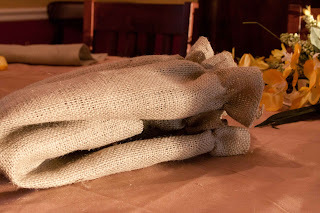 I pulled threads from both sides and moved the gathers to where I wanted them so the burlap looked like this. 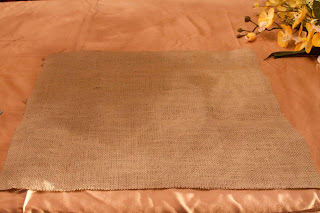 I did this on two opposite ends of my burlap square so I got a rectangle with two gathered ends. I then folded the rectangle in half to resemble a bag shape. 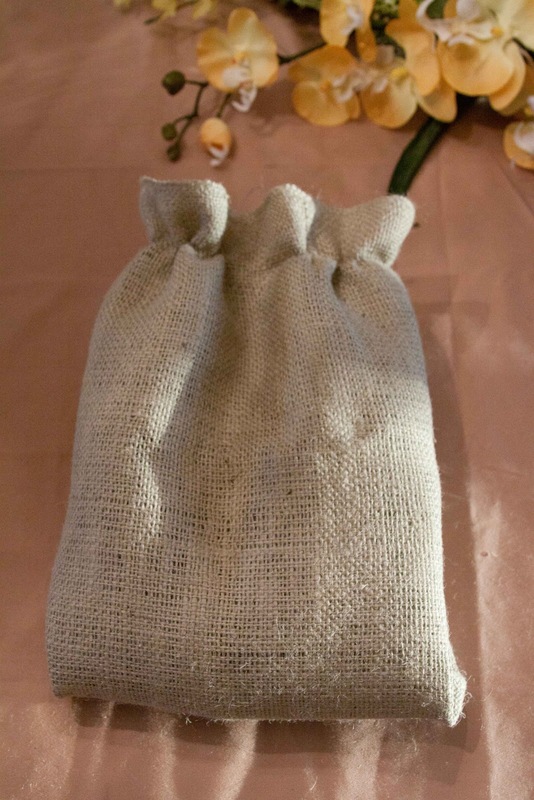 Here's another angle to see the bag shape. I had chosen two different styles of ribbon, one was to be the main pattern and the other an accent. 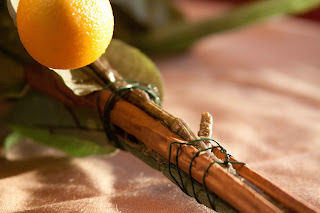 I cut my two different ribbons to length, the main one about a foot longer than the other. Not being one who likes bows, I tied the ribbons around the bag in sort of a makeshift slip knot, making sure both ribbon patterns were visible. I left the sides of the bag open but tucked them in, shaping the bag as I did. 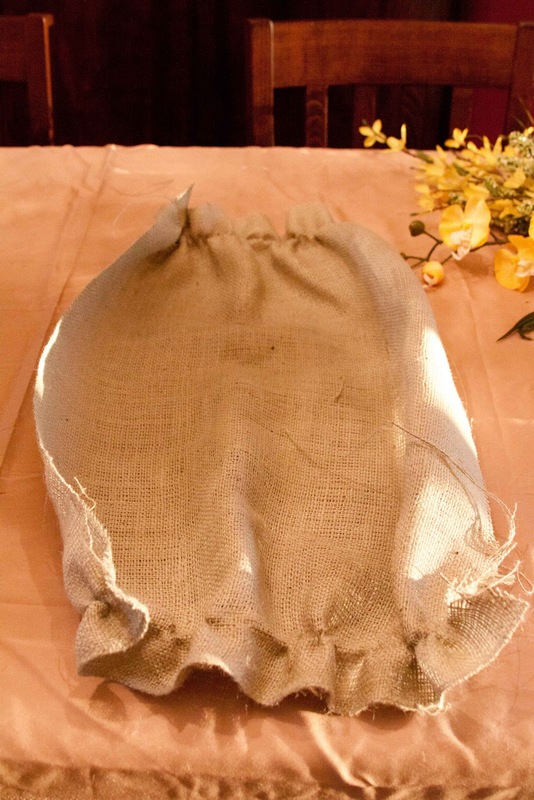 I could have sewn the sides and made an actual bag, but that would have been a few more steps and pictures to post. 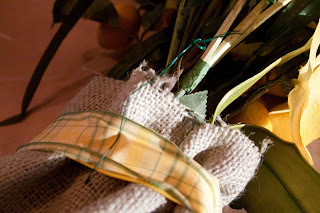 Instead, I slipped the flower stems in the bag and secured the bag to the flower stems by threading floral wire through the bag at the back and looping it through the stems. Now I was ready for full frontal spring. Down came the ice skates that have donned the front door since early December. And up went my new, custom and completely unique spring door hanging. If this doesn't say, "Welcome Spring! ", I don't know what would. very pretty! Im keeping my fingers crossed that the warm days are here to stay! You are so crafty! It looks great! 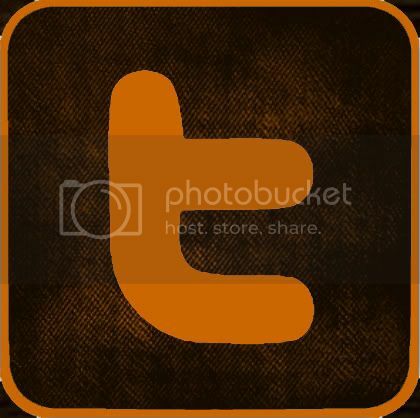 That's really cool! I still have my snowman on my front porch planter, along with my Christmas wreath, snowman flag, and "Happy Holidays" mini flag. Every time I think about taking the flags down, it's raining, so I decide to wait until they're dry...then I forget. Really pretty! It would look out of place here still. It is in the 20's and spit snow yesterday. Ice is in the forecast for tomorrow. Oh goody. In my head its spring! How very creative ... great spring project.